Kettler was a young Romanian who lived in New York City. 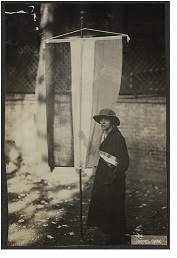 She was arrested for picketing Sept., 1917, and sentenced to 30 days in Occoquan workhouse. She remained an ardent feminist her entire life and had a long history of labor and socialist activism. Her involvement with the suffrage struggle, although brief, was an outgrowth of both her feminist beliefs and her ties to political and bohemian circles in New York that began in her teen years. After she was arrested for picketing and spent 30 days in jail, she was tempted to go back on the picket line, but could not stand the thought of going back into the Occoquan Workhouse. She said the food was especially bad and that’s why several women tried to starve themselves. When visiting a fellow suffragist, Peggy Johns, who became sick from the food and was hospitalized, she found Johns dressed and ready to be transferred to a psychopathic facility in Washington, D.C. Kettler quickly gathered other women and they forced their way into the prison superintendent’s office. Kettler says Superintendent Whittaker tore the phone from the wall to keep them from dialing for help, and then called in other prisoners to beat them. In an interview in the 1970’s Kettler recalled visiting a friend who believed that the picketers were ineffective in getting women the vote. Kettler argued that the picketers did make an impact on government officials because many of the women who were arrested and jailed were the mothers, sisters, wives, or relatives of congressmen and other prominent men in Washington, DC. She remembered how those who were jailed were really “beaten up” and physically injured as a result of their picketing efforts.